I gave in to a somewhat unreasonable obsession with building packs a few years ago, embracing the learning process it provides and admitting that nothing will be perfect and that eventually, anything will go back under the knife to be rebuilt or just scrapped for parts. This lack of attachment helps, I like to think, cultivate some objectivity when it comes to materials and their suitability for various backpack applications. What follows are my summary thoughts on fabrics I’ve used in the last 5 years. Rolltop. TX-07 at the top, VX-07 for the throat. Evaluating the level of waterproofing you want is a good place to start when selecting a pack fabric. In my world this boils down to DP laminate fabrics and everything else. I’ve never built with cuben, don’t anticipate doing so, and have only owned one cuben pack for a fairly brief period. I do not see the cost/benefit ratio for cuben being good enough, and am leery of long-term seam strength and UV stability. That said, performance differences between DP fabrics and more tradition PU (polyurethene) coated fabrics are substantial. There is a huge variability in PU coatings, but eventually all of them will wear off the fabric. 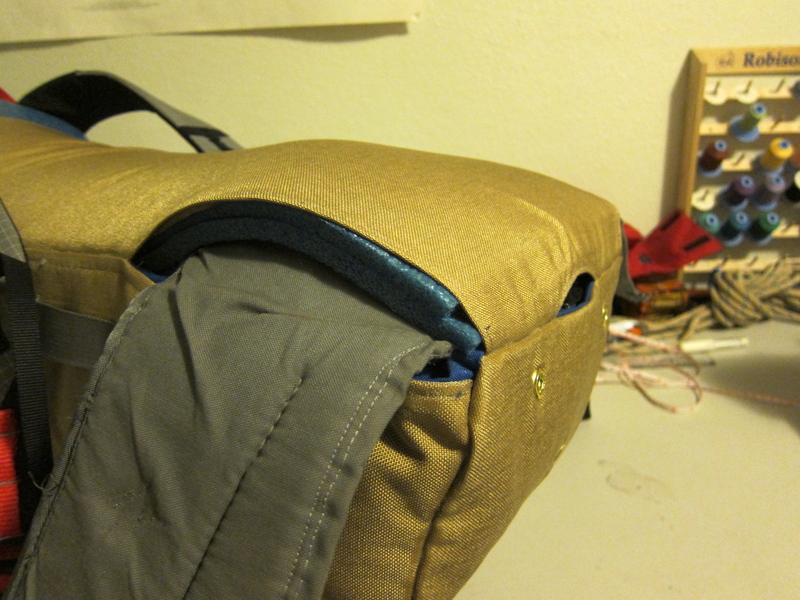 This is vastly accelerated in high friction areas (the bottom of the main pack bag). I’ve had less than good PU fabrics (Golite’s recycled 210d gripstop from a few years ago) delam significantly after less than a year of use, and other fabrics (e.g. the Ballistics on the Cold Cold World Ozone shown below) last a very long time indeed. Determining the quality of a PU coating before you buy is not so easily done. If you can’t find user testimonials it might be worth the trouble of ordering fabric samples first. I’m sure that enough abuse will cause DP fabrics to delam, probably via abrasion wearing through the interior scrim, but haven’t gotten close to doing this myself. It will take a lot of heavy use when/if it happens, and for most people probably isn’t a practical concern. Well used 1000d Ballistics at left, and DX-40 at right. DP fabrics consist of three layers to which pack makers should turn their focus: a face fabric, a waterproof laminate, and an interior scrim to protect said laminate. Variations in each of these three determine performance. The nature of the face fabric will dictate abrasion and cut resistance, and variations in the film and scrim will (partially) dictate fabric weight, pliability, and other things. The VX line of fabrics are the most commonly available, and a good place to start. They’re fairly stiff fabrics, especially compared to traditional fabrics. This makes them easy to arrange and sew, and helps packs stand up and hold their shape. Be aware that with all DP fabrics, errant needle holes are not self-healing. 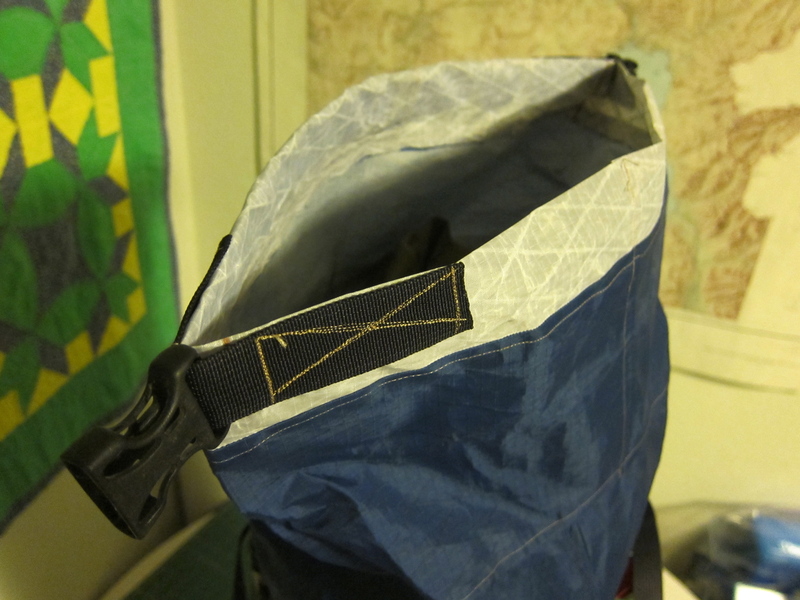 The polyester scrim used in the VX line is white, making the interior of a pack nice a light, and loose things easier to find. All VX fabrics are relatively heavy for the abrasion resistance they provide, compare 4.9 oz/yard in VX-07 to 2.8 oz/yard for conventional 70d urethene coated nylon ripstop. The other parts of the laminate add weight and bulk. This is to some benefit. VX fabrics have, for all intents, no stretch. The extra body increases the tensile and seam strength quite a bit, and make the fabric rather slick on the face. VX fabrics tend to slide through brush very well. What the laminate construction does not do is increase abrasion resistance. As shown in the photo below, use the weight of the face fabric to match fabric to application. Ski edge abrasion on VX-07 during a diagonal carry. A burlier face fabric is needed in this application. In non-abrasion intensive applications, VX-07 is a great fabric. It is good in all but the most horrendous brush, is easy to work with, and has good enough tensile strength to be used in structural elements of a pack (e.g. the backpanel). For things like the sides, front, and throat of a pack it’s an excellent choice. VX-21 has been the most common DP fabric. I’m not convinced that the 200 denier plain weave face fabric gives much more than VX-07, and that the extra ounce per yard is not well spent. Like VX-07, VX-21 does not deal well with abrasion, but does well in all other applications. VX-42 is quite a bit harder to find than either of the lighter fabrics, which is a shame. The step up in durability is considerable, making 42 the lightest fabric I’d use for the single layer bottom of a general use pack. 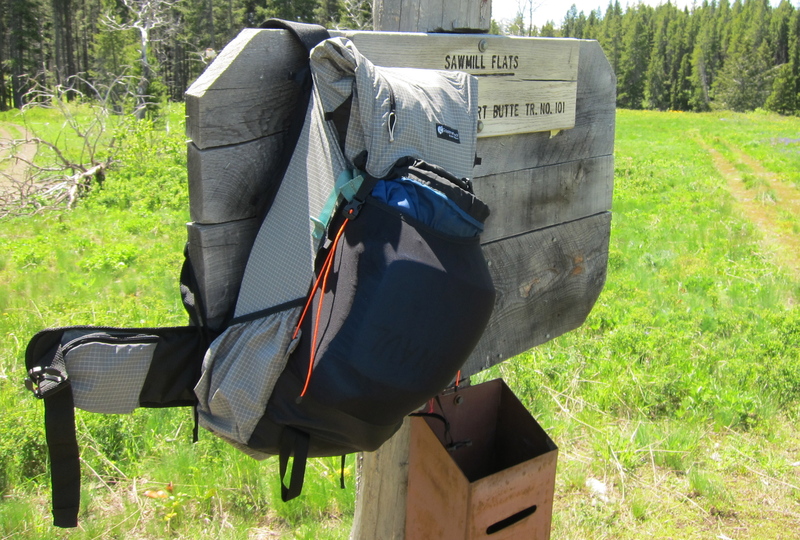 For a hard-use bushwacking and scrambling pack, it is not overkill for the upper as well. WX-40 is the only member of the WX family I’ve used. The laminate and scrim are different than VX-42, making it a bit lighter and more pliant for the same toughness. The interior is totally black, which is the only downside. It’s a shame this has become hard to find, as it’s a nice option to have. VX-07 (blue), combined with a WX-40 bottom (black) for abrasion resistance, and 210D gridstop pockets. TX-07 is a lighter variant of VX-07, almost 2 ounces less a yard. Abrasion resistance is quite poor, making it inappropriate for all but the lightest-use applications, such as extension collars. It is semi-translucent, providing good visibility inside the pack and cool look. DX-40 is a specialty fabric, with dyneema in the weave. Though as seen above the polyester part of the face can get fuzzy fast, this damage appears to be primarily cosmetic. The combination of the abrasion resistance and waterproofness makes DX-40 a good option for extreme use, like expedition bushwacking in wet environments like coastal Alaska, though it is expensive (~30 dollar/yard) and hard to find. When the waterproofing of DP fabrics are not required, there are cheaper options with equivalent performance. 1000D Cordura (tan) for the main pack exterior, 500D Cordura for the interior elements (blue) and hipbelt (foliage). As mentioned above, coating quality varies quite a lot. Nonetheless, I prefer to use PU fabrics for applications where long-term waterproofing is not so important. Examples include the canyoneering pack shown immediately above, and exterior pockets. PU fabrics are cheaper and more flexible than DP laminates of equivalent weight, attributes which can be put to good use. Cordura is still the classic nylon pack fabric, and for good reason. It still has a good combination of weight, abrasion resistance, and general toughness. 500 and 1000 denier remain the most common variants by far, and can often be found on sale for 5 dollars a yard or less if you’re not picky about color. These fabrics can be had in just about any color you might like. 1000d is about 3 ounces a yard heavier than 500 (8 versus 11, approximately), and is more abrasion resistant. Realistically, most applications will not require that extra toughness, and 500d is a better choice. One of the nicest things about heavier Corduras like these is that you can stitch and bartack away without the need for reinforcing fabric to make sure stitching doesn’t pull out. It can make construction a lot simpler, and thus a pack lighter than you might think. Cordura is also high-friction, and thus makes a good hipbelt material. New, slick faced Cordura will wet out after a full day of steady rain or a few hours on the bow a packraft, but moisture retention doesn’t get bad until the fabric has gotten a solid beating which fuzzes out the face a fair bit. A double silicone coated 500d cordura remains a pack fabric I’d love to try if it existed. Ballistics nylon is similar to Cordura, with a different, denser weave. It is typically a bit heavier and more expensive than the equivalent Cordura, and available in fewer colors. When you need serious abrasion resistance above all else, Ballistics is the way to go. The gain over Cordura is not huge, and the extra expense is often not worth it in my book (hence the 1000d on the pack above). GG Gorilla, with grey 140d Dyneema Gridstop. Dyneema Gridstop has become ubiquitous in the last 5 years. The distinctive white grid has curb appeal, and the tough threads make for a very effective ripstop. I’ve used the 140d variant my Gossamer Gear Gorillas, and found it to be acceptable for trail and lighter use off-trail packs. The fabric takes a beating in side pockets, and during something like canyoneering, but does fine for mild to moderate bushwacking. The 210d variants (the green stuff above) are a bit more abrasion resistant. Due to fashion, gridstop is darn expensive compared to Cordura, but the nice tight weave makes it better than comparable weight PU fabrics like the 200d oxfords. The above fabric do just about everything I’d like them to. The only other fabric I’ve used in the last few years in 30 and 70d silnylons for interior pockets and extension collars. As mentioned above, the only thing on my wish list is a double-coated nylon which would resist moisture gain from water long-term. Even DP laminates retain water weight, which it would be nice to avoid. great writeup! Another fabric you might consider is VX-21 RS. The face is ripstop 210d nylon so abrasion resistance is increased. In addition the waterproofing is a PU coating giving the fabric a softer hand and an ever so slight stretch. I use it in many of the bikepacking bags for Bedrock Bags with good results so far. Interesting. So is the PU in place of the PET film, in that it also has a scrim lining? Yes exactly. 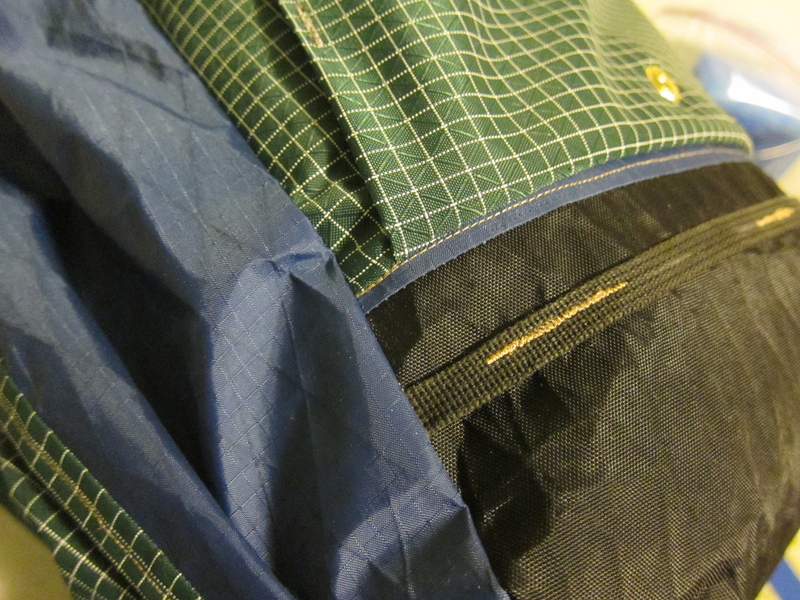 In this case the inner lining is a 50d polyester taffeta. 6.3 ounces/yard. i know that cuben hybrid(with polyester 50d)is pricey,but i’m suprised that you did’nt try it.at least for a test. Cost, combined with the doubts I mentioned about longevity. If I’d going to spend 30+ dollars a yard, I want no doubts about fabric integrity. Still, I’m sure I’ll work with it eventually. Thanks for the great writeup and frankly blog in general. I’ve enjoyed your adventures and photography through the years, keep up the good work. Question for you regarding your material selections and review above. I’m curious to know your thoughts on these materials and how they relate to a specific hunting pack. I know a little about a lot of fabrics but nothing specific. What would you recommend for a very dedicated hunting pack. The material would have to not only be very durable but also move quietly and have no scent. Any thoughts? Very much appreciate the time, thanks! Cordura is quieter is use than the VX series, though the heavier VX fabrics are less crinkly than the lighter ones. That said, I don’t think there would be a difference between the two when stalking, only when packing and unpacking the pack. That said, I’d go for VX-42 (or the multicam VX-33, which I haven’t used) for a hunting pack. More than tough for any reasonable use. The waterproofing of VX fabrics is for me a no brainer for a hunting pack, given that it’ll be out in autumn and likely off trail. Do you think TX-07 would be too light for a thru hikers pack? I’m just getting into MYOG and planning to make gear for a re-attempt of the PCT next year. I would make the bottom out of x50 and back possibly out of WX20. I think it is too light. Might work for upper sections. Vx07 is more duitable, vx21 the safest bet. Nice writeup. Do you have a favorite small batch fabric supplier? 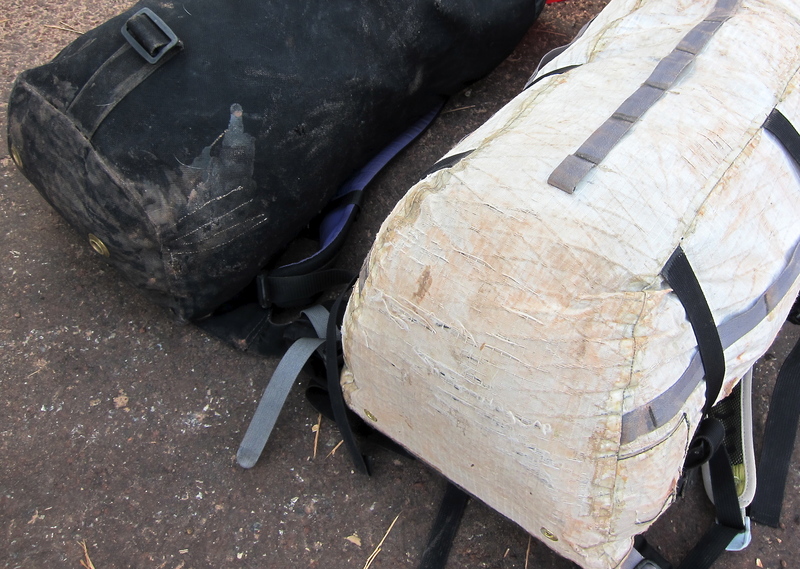 Seems to be rather difficult to find some of the fabrics such as 50D Dyneema. It is tough these days. Cascade Craftworks was a good resource in the past, but these days most things are out of stock. Rockywoods has an excellent selection of D-P stuff, and an added bonus is that they usually have most webbing, buckles and so forth.